Published on August 7, 2010 in Complaints, General T&T, People's Partnership, Politics, Protest, Sports and USA. 28 Comments Tags: Abuse, Anil Roberts, Foreign Affairs, Patrick Manning, US visas, USA. THE fresh row that has broken out between representatives of the Government of Trinidad and Tobago and the American Embassy in Port of Spain over the issuance of US visas entered a decidedly nasty phase last week. As this country’s Minister of Sport and Youth Affairs, Anil Roberts, waded in to the embassy’s Public Affairs Officer, for remarks he made in response to the Minister’s earlier comments concerning the frustrations being faced by nationals. To be sure, the matter has been an ongoing one inherited by the current administration, Mr Roberts saying he raised some concerns with the Minister of Foreign Affairs on the very day that they were being sworn-in to office. But without re-entering the substance of the latest contretemps, the Minister’s comments were clearly ill-advised, without tact or finesse and certainly out of place, given that he is not the minister responsible for foreign affairs. In the face of growing concern about denial of entry to Trinidad and Tobago (TT) citizens to the United States, US Ambassador to Trinidad and Tobago, Beatrice Wilkinson-Welters yesterday indicated that attempts will be made to better handle the matter. You may know soon exactly why your visa application was denied. This was the statement made by United States Ambassador Beatrice Welters, during a meeting with Foreign Affairs Minister Dr Surujrattan Rambachan yesterday. 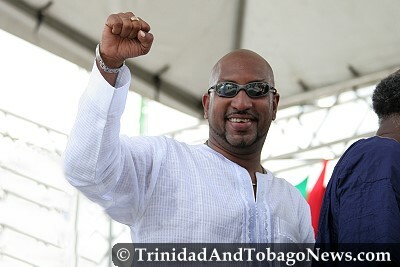 Saying the people of Trinidad and Tobago had nothing to gain by “insulting” the people who conducted American business in Trinidad and Tobago, Opposition Leader Dr Keith Rowley suggested yesterday Sport Minister Anil Roberts’s criticisms of a US Embassy official should not be encouraged. UNITED STATES ambassador to this country Beatrice Welters has come out in defence of her consular officers, saying they always process visa applications according to the letter of the law. “We take the letter of the law very seriously and, thus, all of our processes are according to US legal norms, especially those enshrined in the Immigration and Naturalisation Act of 1952,” she said in a press release. Welters’s statement was issued following claims made by Minister of Sports and Youth Affairs Anil Roberts the visa-selection process was not fair. PUBLIC Affairs Officer at the United States Embassy, Matthew Cassetta, is “farse and out of place”, says Sport and Youth Affairs Minister, Anil Roberts. “As a minister here to serve the people, if the media asks me a question, I choose to answer, I choose not to say no comment…because the media represents the views of the people,” he said. Roberts was speaking at a press conference at the ministry’s head office in Port of Spain yesterday in response to criticisms by Casseta that he followed the wrong protocol in his response to an Express reporter who approached him after he spoke to someone protesting about the embassy’s visa system. T&T Government ministers should use the official means of communication that are available to them if they want to communicate their views to the US Embassy. Public Affairs Officer at the embassy, Matthew Cassetta, told the Guardian that yesterday in a telephone interview in which he was commenting on media reports that relayed what Sports Minister Anil Roberts had said concerning US visa applications. According to media reports yesterday, Roberts said on Sunday the US Embassy needed to have a clear policy on visas and mentioned the names of two athletes who were denied visas to study in the US. Commenting on this, Cassetta said there were avenues for T&T Government Ministers to voice their concerns to the embassy. Speaking with the Express during the re-enactment of the Declaration of Emancipation on the Brian Lara Promenade, Port of Spain yesterday, Roberts said he agreed with some of the issues raised by a man who carried two placards objecting to the US visa policy. “As citizen we want a good relationship with the US, we are friends, we are trading partners but really and truly more explanation should be given to citizens as to why they are being denied,” Roberts said. 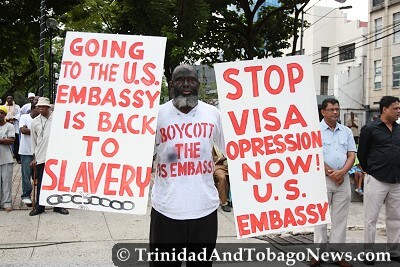 The protester Addil Abdullah, who said that he did not want a US visa, held placards during the emancipation celebrations in Port of Spain. Anil is right. The PNM did not have the courage to ask for answers to visa problems with the U.S. The embassy must be able to explain the criterion for getting a visa. If a person applies and their money is taken then they DESERVE an explanation or their money should be refunded. Money taken without explanation is simply stealing. Over time these applications can become a form of fund raising, we all know that America needs the money. And they can “jack up” the cost of application at any time. Let us hope the U.S. will treat Trinis as friends and not allow a few bad apples who prospered during the PNM years to tar the nation. America is often guilty of handing out brutish,abrasive and domineering behavior towards other nations; however, America screams loudly when other nations react in like manner. Well guys, there is still Canada, Australia , and England, who seems to be more welcoming. Refugee cries worked well in 1986 , when Anil was obviously learning to spell politics, Super power, and backward , clueless, Third World country. What jokers these political comedians, and gullible fans are! Four mounts ago , they again embarrassed themselves on the grand stage , by rolling over backwards and tweaking their immigration policy in a politically charge move ,and allowed an American alleged Kamla handler,and Obama 4th tier advisor, into the country cart blanch , and so feel that this entitled them to some quid pro quo privilege in return. Would someone tell them , you only acquire respectability as a serious political player , when you learn to develop some sense of self worth , and quit groveling to every foreigner, disguised as an expert, that appears on the horizon- in part, because 90% of our citizens lack a national identity, and patriotic bone in their big toe, ehhh cousins Kheim and T-Man? It must have been something President Obama saw at the Summitt of The Americas. I agree with Neals comment,” 90% of our citizens lack a national identity, and patriotic bone in their big toe”. neal that was a very intelligent response to these jokers. Why is Anil making such a big deal with this. As far as the americans are concerned they do not want trinidadians in their country. I think they should start declining all trinis including “LOUD” mouth Anil. He has made it bad for all trinis who adore and wants to go to america. To make matters worst, its not even his portfolio. Anil you got something you did not expect so shut up and go about your real job. You have made yourself a BIG FOOL as usual. You so want to represent trini but at the end of the day YOU JUST SCREWED anyone who doesn’t have a visa and trinis are so stupid that they are backing you and think you did the right thing. YOU IDIOTS!! “He has made it bad for all trinis who adore and wants to go to america” true Trini. My understanding is that it was already bad for Trinis going to America. The Americans have decided based on Anil’s action to review their reasons for not accepting visa applications. So it is going to get better. True Trini it is people like you who over-dramatize a situation without looking at it reasonably. Change can only come at times when there is conflict. Think about that..
Notice a pattern here folks ,Venezuela is America 3rd largest export market in the Latin American region, and for all of Baby Castro ,Chavez , the bombastic, buffoon’s empty media posturing yapping , his country is the world’s fifth largest exporter of crude,and the No. 4 supplier of the United States, to which it sends 1.5 million barrels per day, according to official figures. I don’t even have the energy , or rather inclination to investigate my one time loving country’s track record on that score. Would someone again tell these fools , that the only way you can stand up to a powerful force , is by showing some spine , and using your assets to your advantage, in pursuit of long neglected ,national interest. “The U.S. has increase cost for a Visa application and given NO explanation. People like you Neal have no problem with that. “You are absolutely correct khem , and it’s due to the fact that both my self, as well as national ingrate , and joyous Englishman ,Trini ,Uncle V.S Naipaul , is eating in the same non patriotic calabash , and could care less if America invade Trinidad , make it a ward of Tobago, then decide to call Scarborough the capital – as that would some justice. The difference is that he Naipaul started despising his country the day he acquired his Oxford scholarship , I instead , decided to use May 24th , as my ‘jump off point.’ Talk to me again some time in 2014 , or earlier, if Jack our PM in waiting don’t decide he want’s a divorce , to end the tenuous , political charade, and quickly cash in on his exorbitant financial investments.What’s that ,”people with millions cannot get Visas?”Thanks America for looking out , now perhaps this closet crooks and bandits can start to invest some of the loot at home. Ah shocks, the internet can give one access to the offshore bank accounts. Well, you can’t win them all. Khem I really think your response”over dramatize a situation” should be directed to the Loud mouth.America will not be looking at any processes, their process in their mind is already sound. Very surprising that you people can’t see pass your nose. It’s a little premature so you all will see. BAD MOVE by loud mouth. “Khem I really think your response”over dramatize a situation” should be directed to the Loud mouth” –True Trini. Too bad you can’t just walk over and get amnesty from the Obama Administration. Too bad you can’t just walk over and get amnesty from the Obama Administration.-Curtis. I was in New York about a month ago. I have no problems with the Americans. They are good people whom I love dearly. But I am NOT blinded by love. I see the other side also. As for amnesty, I would not want to live in America. No Curtis , that could have only work up to May 24th 2010. Today ,we are instead on the part to being a vibrant, thriving multicultural democracy,where good governance, equality , security, economic prosperity , political transparency , and peaceful coexistence is the norm. ‘Your country,’ is the one that now offers amnesty. I am shocked that Neal has so quickly lost his patriotic and spirited love for country which he so often shouted from the rooftops. Neal, your stripes are showing! Ah T-Man my brother,that hurts . Ever the sly rascal , ehh? Ok , I must confess, that in the words of- you guess it- the wisest woman that ever lived,I am just “playing dead to catch cobeaux alive.” De man or woman that could make me hate this blessed land , ain’t born yet, my friend. I still envy Uncle V.S. though, and no it’s not for his writing skills, as I too stop reading after Miguel Street, and The House for papa Biswas. Keep the faith, and congrats on your victory. Let democracy reign. Trini is Boss- imagine waiting One whole year for a Trini Passport appointment, after the appointment you have to wait another Two months for De Passport up in New York- whoo-ray for Trini’s- Long Live this Blessed People !!!!!!!! The fact that a racially segregated ,Third world country is blessed with an abundunce of natural ,underground,economic resources,does not automatically elevate it to a progressive,enviable political,and economic player Sam. Don’t worry though,your newly minted government,will soon embark on a costly fact finding ,witch hunt exercise,then again sccumb to the urge to have a tribal purge ,and replace incompetent lifelong political stooges,with clueless, political bums. It’s the kind of change we can all believe in,yes? Has the US Embassy considered that perhaps we DON’t want to run away and live in their country because their economy is terrible, their own people can’t get jobs and they are currently on a fast track to poverty? We jus want to visit for a lil holiday….go Disney, walk on Times Square, take a few photos & ride back home to Trinidad where we all have a wuk and could afford to shop in de grocery. The greatest BS I ever heard was that it takes $800 to process an application. Then some people say that the officer just watch you, hold your papers, give them back to you and tell you you do not qualify. What processing cost? Is the officer’s time for 5 minutes and use of the Embassy’s precincts while standing for about 2 hours worth $800? The US Embassy has to come up with another justification. I think US is so broke – after fighting an illegal war in Iraq – that they have to get money to pay the officer’s salary. Sorry KDD, that country did not become the leader of the free world just by rolling over , so as to play dead ,and let folks like you conniving Trickydadians run over them , my friend.It was the same story that was given to the Canadians in 1986 when Panday, Suraj Rambachan, Sudama, Ramdath, and Awe wee Bouy was in charge . Certain unmentionable stated that all they wanted to do was go aand seee the CN Tower , and Niagara Falls , then whalla , refuge status request. Keep the faith,and one love. “NEW DELHI: India may drag US to the World Trade Organisation for its new “protectionist” move in hiking professional visa fees, a step that will make Indian IT companies less competitive in the American market. The Americans need money to protect it’s Mexican border so it is simply a case of Peter paying for Paul. They are doing this to all third world nation. European nations remain unaffected. It is the black man who have to pay when the black man in charge. But i cant help but feel iz only a stupid trini who would want to run and hide in the US at this time. They are no longer the land of milk and honey. I rather stay home & plant 2 tomatoes in my back yard if tings get tough. Quit whining concern citizen, for your PM recently came to the US to do the usual jig and dance prostrations at the feet of big daddy America ,in keeping with a new political regime wishing to stay in proper social standing with the big boys on the grand stage. Mind you ,there were some initial hiccups when initially,the misguided new regime ,embarrassed themselves by ignoring an initial Caribbean COnference visit invite ,to pay tribute to and all powerful neo feminist global leader ,in Secretary of State Hillary, and so this Visa pimp slap ,was the blow back. I think that the lesson was learned that there is a certain pecking order that must be adhered to , irrespective of some phony ,Time magazine article listings as to which women were the political bosses ,and most importantly C, comes before K, yes? In the event that you are too dense to decipher what I am referring to, then let me know.I’ll be more than willing to educate.